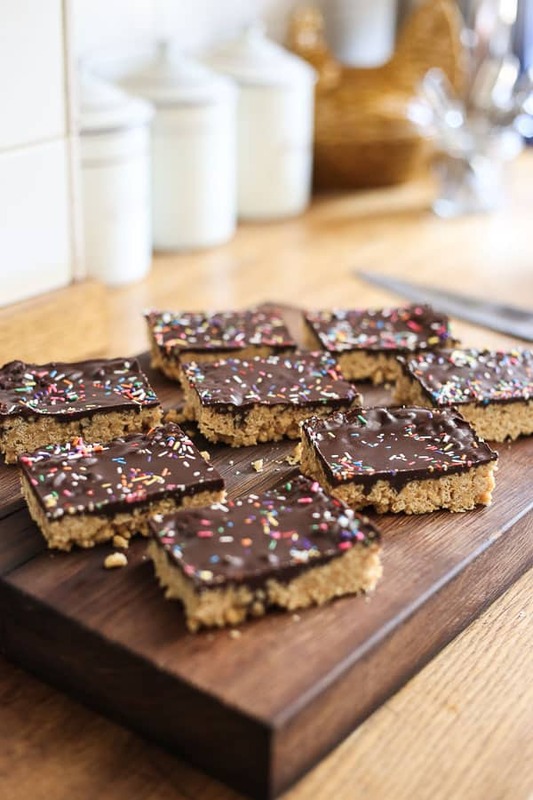 These quick easy No-Bake Peanut Butter Chocolate Crispy Bars are perfect to make for a crowd. 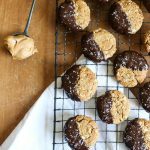 They are gluten-free with simple switches to make the recipe vegan or refined sugar-free. We’re slap bang in the middle of summer and every weekend seems to throw out another event, festival, school fete or family gathering. There always seems to be an occasion I want to bake for. Aside from loving baking for family and friends, I also like to bake for local events and cake stalls if I’m asked since they are always for excellent causes. 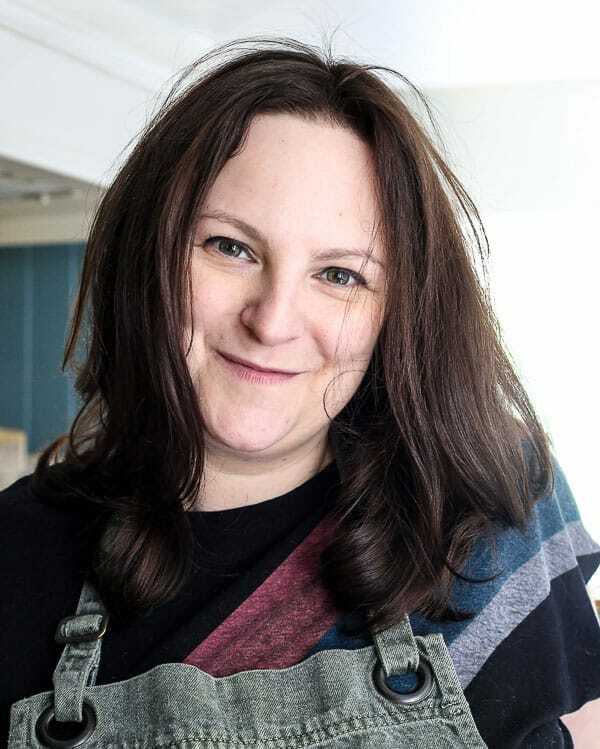 However, it’s not as easy as throwing together a quick Vicky Sponge these days, not that those don’t go down a treat, but the good people of North London know good cake and won’t pay money for something not up to par. 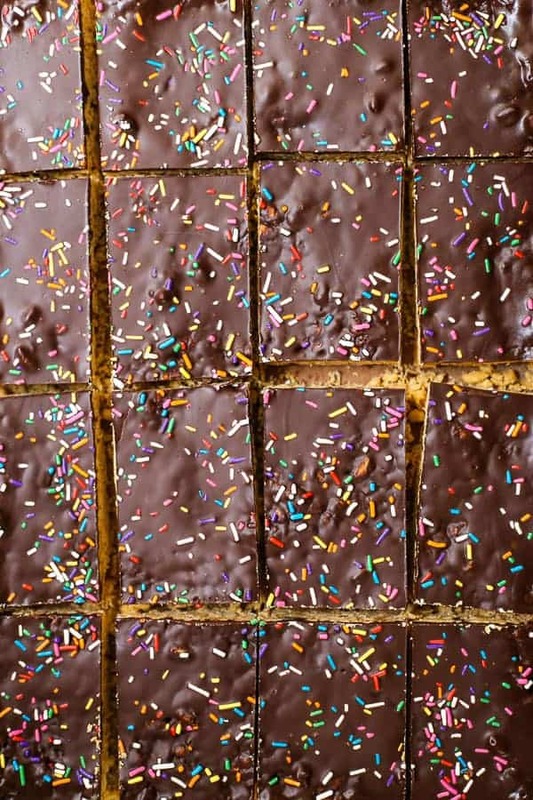 It is also worth for these cake stalls to be mindful of its potential customers increasingly varied array of food intolerances, allergies and lifestyle choices. The WI cake stall which I baked for a couple of weekends ago specifically asked its members to include vegan, gluten-free and sugar-free cakes as part of its offerings. This is where I think I can throw my hat in the ring and I’m always happy to fill that free-from baker vacancy. I have limited time to bake these days though thanks to two young children and a business I’m running in evenings and nap times so I have to be smart about what I can do. I need to produce something quickly with simple ingredients and preferably no-bake because I can’t face my oven being on in this hot weather. 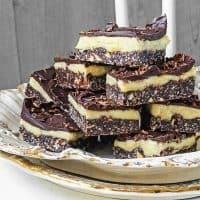 That’s why these No-Bake Chocolate Peanut Butter Crispy Bars tick all the boxes when you need to produce a sweet treat for a crowd and this recipe is excellent for adapting to whatever criteria you need it to. 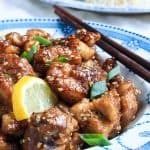 The basis of the recipe below is gluten-free as I have used gluten-free crispy rice cereal which is very easy to get hold of now. 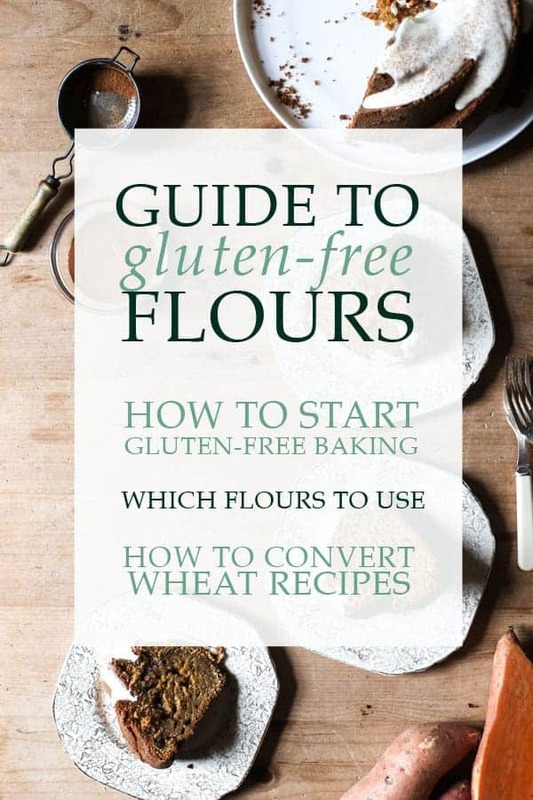 I found it in our Sainsbury’s Local in the gluten-free section. 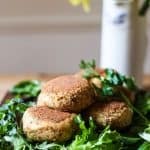 The way I prefer the recipe is not vegan or refined sugar-free but it is easy to adapt if that’s what you or your crowd need. You can see there are two types of sugar here – honey and caster sugar. I have tried different kinds of liquid sweetener including golden syrup and rice malt syrup but settle on honey because of the flavour. 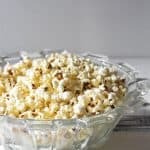 It’s this ingredient that makes the recipe non-vegan. 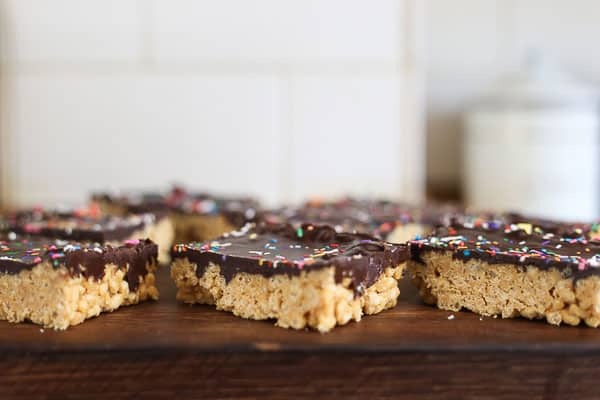 So if you needed to make these No-Bake Peanut Butter Chocolate Crispy Bars for a vegan crowd then just swap out the honey for either golden syrup or rice malt syrup. I prefer the golden syrup as it gives the finished bars the right amount of sweetness and stickiness. You would also need to ensure you used vegan chocolate in the chocolate layer. It’s also worth noting that if you are not vegan and don’t have any coconut oil at home then by all means substitute it for butter. I prefer the consistency of the chocolate that coconut oil brings but butter is perfectly acceptable too. You might wonder why there is caster sugar in the mix as we’re already including a lot of honey. They honey is there to give the bars a lovely chewy texture and beautiful flavour. The caster sugar is there to help with the structural integrity of the bar. The first step in the recipe is to create a caramel by melting the caster sugar with the honey. The caramel helps to firm up the peanut butter crispy rice base and means the bars can easily survive a few hours out of the fridge whilst they are being served out. 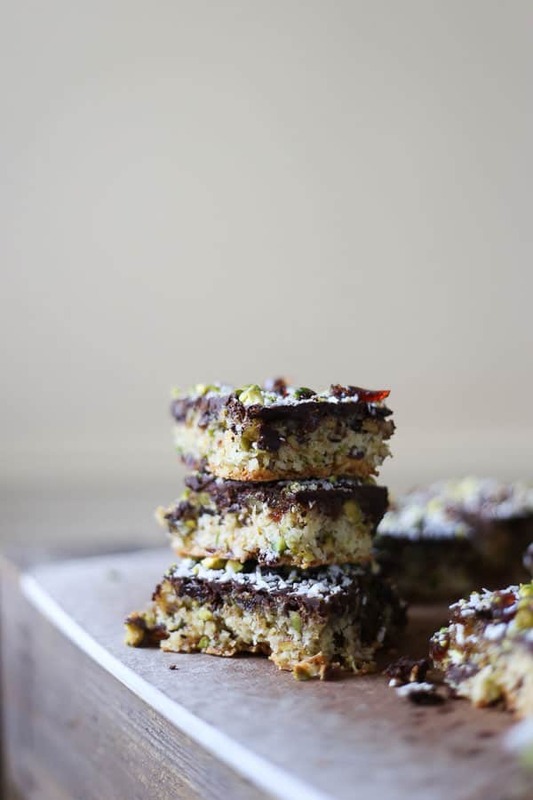 If you wanted to make the recipe refined sugar-free then by all means leave out the caster sugar, skip the caramel part and just use all honey, but your bars won’t have the same structural integrity. 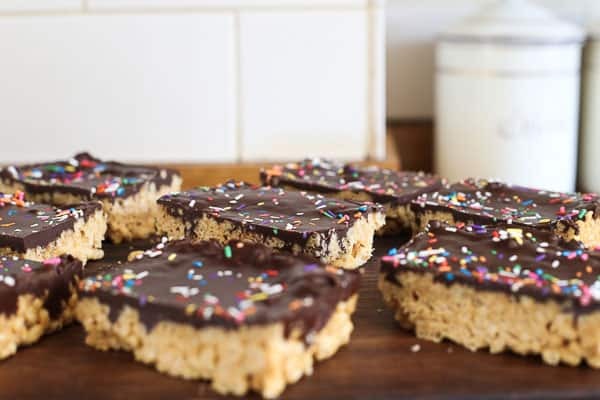 They will be fine if you eat them directly from the fridge but you won’t be able to leave them out without the peanut butter crispy rice base falling apart. Have I convinced you yet that these are the bars you need to serve to a crowd? Well then, let me give you some other variations. You don’t like peanut butter? Substitute with almond butter. You have to avoid nuts? Then tahini or sunflower seed butter instead of the peanut butter would be absolutely delicious. 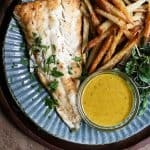 You can literally take this recipe anywhere you want to go. They appeal to adults and children alike and are absolutely a guaranteed crowd pleaser. 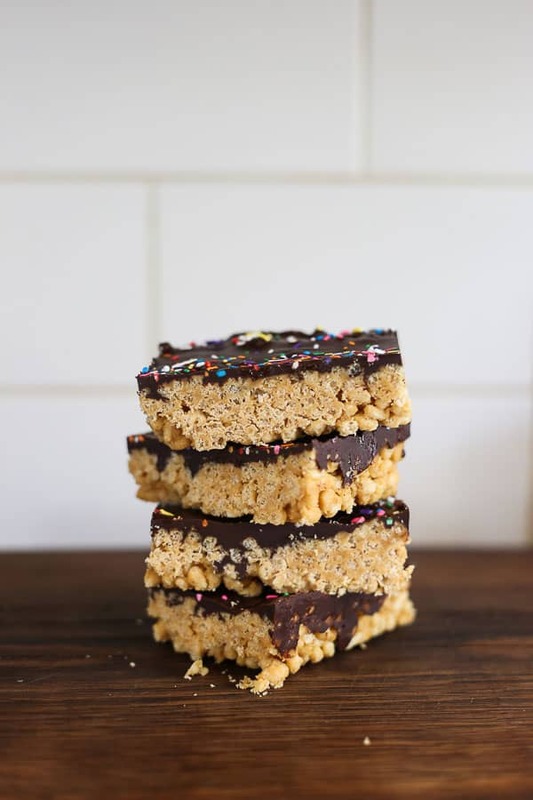 So it makes sense for to turn to these No-Bake Peanut Butter Chocolate Crispy Bars whenever you need to feed a crowd, fill up a school cake stall or even, dare I say it, just bake it for yourself. To be honest, you don’t need an excuse. Line and grease a 13x9 inch cake tin. Pour the honey and sugar into a medium saucepan and heat gently until sugar dissolves. Bring mixture to a boil to form a caramel then remove from the heat. Stir the peanut butter into the saucepan and mix until the mixture is smooth. Place the crispy rice into a large bowl and pour the peanut butter mixture over and mix thoroughly until all the crispy rice is covered. Scrape it all into the cake tin evenly and press down so the surface is smooth and packed in. Meanwhile melt the chocolate with the coconut oil and salt in a bain marie or bowl set over a saucepan of simmering water. 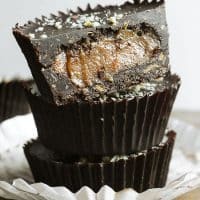 Once the chocolate has melted, pour over the peanut butter crispy rice base into an even layer, tilting the tin to make sure it goes right to the edges. 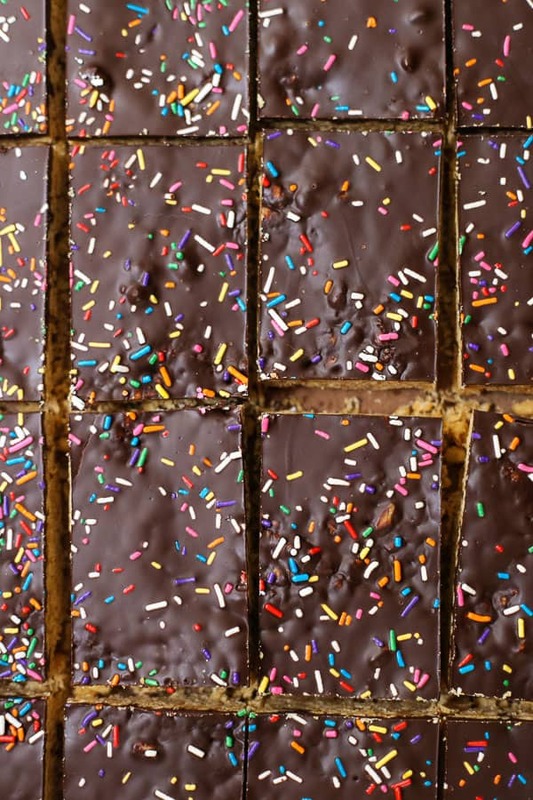 Scatter some sprinkles on top and place in the fridge to set for a couple of hours. Remove from the tin and cut into 16 bars. is the one I use and is the perfect size. Double boilers are way more useful than you think they are going to be. I use one every time I melt chocolate, make a curd or make swiss meringue.